"Elizabeth Warren knocks Trump, brings Democrats to their feet in Reno" read the headline in the Reno Gazette Journal on June 23. It has since been downgraded to "In Reno speech, Sen. Elizabeth Warren says Democrats must 'clean up' after Trump." But the point was made. She was on the warpath. The media instantly embraced her as the media embraces anyone who talks trash about the president. The Democrat senator joined Stormy Daniels, Michael Avenatti, and a whole flock of celebrities who grabbed a headline by calling our president Hitler or some other dumb name. The Washington Post said, "If Trump is itching for a fight, Elizabeth Warren is happy to give it to him." New York magazine said, "Elizabeth Warren Is Waging a Full-Body Fight to Defeat Trump." And the usually nonpartisan Roll Call said, "Warren Smacks Trump Back Over DNA Test." That last story was over a tweet. But the senator turned media star took a DNA test. She triumphantly shared the results with the press in a slick five-minute video. The DNA test found she was 1/1,024th Indian. And now we welcome Warren to the Trump Schadenfreude List because it backfired. Bigly. Hers was a yuge mistake. You see, most of us would say one Indian in an auditorium of 1,024 people does not make that crowd an Indian tribe. Not only is Pocahontas not an Indian, she is not a Poca Dot. 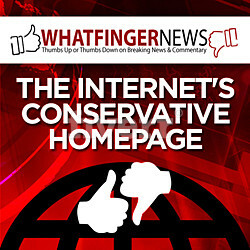 The Cherokee nation denounced her. Johnny Carson would have mocked her out of existence. But Jimmy Fallon is to afraid to risk his job to joke about the 1/1,024th Indian Princess. Instead, the Fake News media immediately pretended one drop of blood made her Pocahontas. 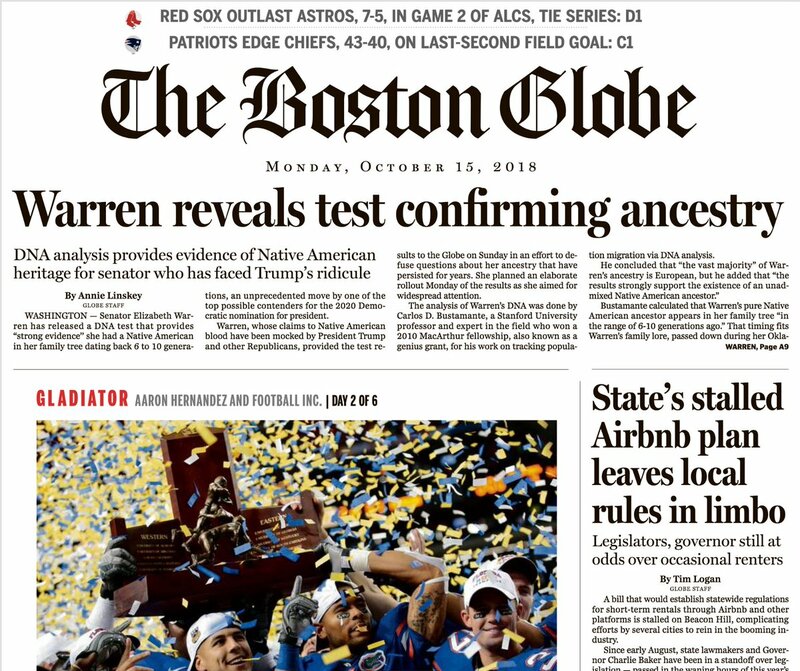 But the public saw through that and after publishing that headline, the Boston Globe re-wrote its own history by changing it to "Warren releases results of DNA test." Joe Concha in The Hill wrote, "It's hard to overstate just how spectacularly poor Elizabeth Warren's decision was to tout an analysis of her DNA results showing she is Native American — as in possibly 1/1,024th Native American. "At first glance, on Monday morning — just three weeks out from a crucial midterm election, out of absolutely nowhere — when the progressive heroine decided to go ahead with this announcement, things looked pretty good, at least from a media perspective." 1/1,024th. That's what the public saw. Concha wrote, "But Monday's decision to go ahead with a laughable DNA test that only makes her look worse in the places that really matter — where she needs to win, meaning not Massachusetts, New York or California — was one that will follow her throughout the 2020 campaign. "Already, you can see the signs at Trump rallies: '1/1,024th.'" Howie Carr coined the Fauxcahontas nickname. He wrote in the Boston Herald, "Elizabeth Warren — busted yet again as a fake Indian. Nevertheless, she persisted." The chortling on the right was only half the indignity. A columnist in Think Progress wrote, "Elizabeth Warren’s DNA test hurts Native people." But Caitlin Flanagan of the Atlantic gave the Democrat Party talking point: President Trump bullied her. Flanagan wrote, "At some point she decided that the thing to do was to have a DNA test and make the results public, which has only proved that Trump can push sensible people past the point of madness. Putting one’s genetic information into the public conversation about one’s fitness for office is a bizarre idea. Moreover, her insistence that it would offer definitive proof of something her supporters believe in was tone-deaf. Doesn’t Warren realize that race is a social construct and whiteness is an idea? Doesn’t she know that the science of genetics is often used as a tool of the oppressor, that you cannot destroy the master’s house with the master’s tools?" Biology is a social construct! I am laughing too hard to type. If President Trump bullied her, then she cannot be president. No one wants a president who is so easily bullied. She lied about her heritage to get the racists at Harvard Law School to hire her. That helped make her a multi-millionaire. But the lie finally caught up with her. Maybe Liawatha will offer PDJT a peace pipe.
" Not only is Pocahontas not an Indian, she is not a Poca Dot." I wondered how you were going to work that in, Don.. Wife and I have varying amounts of Native blood-all verified via genealogists. We wanted the whre and when of what we were. BTW wife is a cousin of Pocahontas via her half sister Scent Flower..
Don, Remind everyone that October 24th,tomorrow, is 10/24 and is also National Fake Ancestry Day. Whatever your fake ancestry, Harvard and democrats have to believe you. You have about 1000 choices so mix them up- 1/1024 stalin + 1/1024 clinton +... 1/1024 antarctican. Pocahontas Warren has given the USA an adult day to party as anyone/thing. Halloween is for children. And everyday is Fake Ancestry Day to democrats. Thanks, Liz, er, Pocahontas. "You cannot destroy the master’s house with the master’s tools." Whoever thought that up never heard of saboteurs. Or Democrats working "within the system." Most Social Democrats are tools.. albeit useless ones! Fauxcahontas took her bow, notched an arrow, drew back her arm and took careful aim at Trump, and shot herself in the foot.